And I'd bet someone collects all these passwords and makes them available. There are many approaches to manually trying to recover the password, but it's important to know where to look. If you reach better speed, please contact me. The file names in the archive are also scrambled including a word at the start and numbers and characters. There are a total of 100 freeware programs listed in this eBook, each with a brief description, download link, and review link. You always need the latest drivers! It uses brute force attack to recover passwords. Hydra is a very versatile penetration testing tool that has been successfully used with most modern network security protocols. On the other hand, you have the option to choose from different case combinations from dictionary mode. That is, unless you learn the password by asking the owner who protected the file, or by finding the place where the owner who protected the file may have published the password. You might find the password. If this has been configured on a network, chances are it will only allow 3 — 5 attempts before locking down the account. To try that option, you can create a simple script or program that reads the word-list and tries to apply the contained passwords one-by-one. In addition, the downloaded zip file from online website would also be attached with a password you didn't know. In most professionally configured networks, there are a few security components that render Hydra practically useless and you will probably fail at your attempts to crack passwords and could possibly be charged with a crime for your actions. Can either use brute force attack at your locker or using its extensive dictionary. The dictionary files word lists are not included in the installation, but they can be purchased separately using a link on the publisher's website. I guess this performance rate should be the number of words tried each second. More questions and answers you'll find in the included documentation. To maximize the effectiveness of a brute force password attack, a good hacker will also incorporate elements of social engineering into a custom password list that specifically targets users within an organization. It supports a number of exclusive attacks to crack zip passwords. If you are trying to gain unauthorized access to networks in your spare time, you could very well have the police knocking at your door in no time. At least, I couldn't use it. Zip Password Recovery can recover lost passwords for zip archives, it uses a customisable brute force attack to recover passwords. 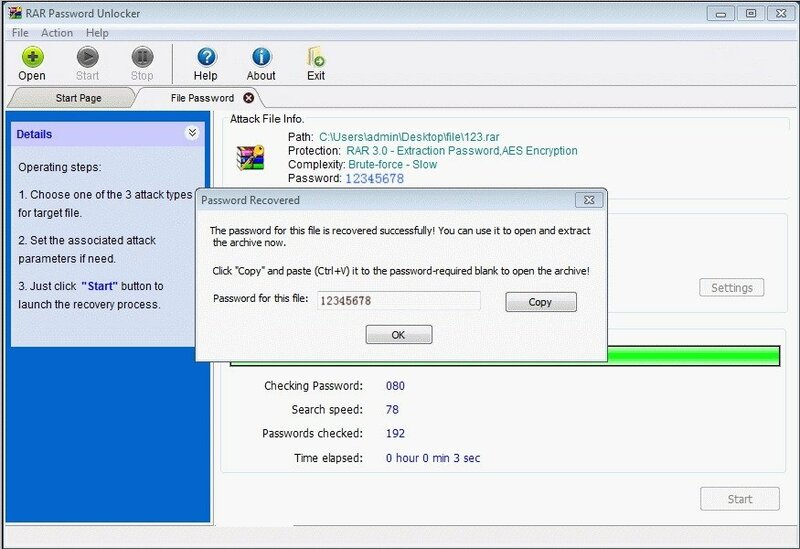 Zip password cracker is a software program which facilitates you to recover your Zip file password if its forgotten. This utility is easy to use, and works with just a few clicks, and is outfitted with several features designed for professional use such as brute force attack. The thing about brute force is that the time of cracking rises rapidly depending on how long the password is, how many characters are being used in it and so forth. Would you like to answer one of these instead? This is because the program allows you to choose certain character sets. Additional information on the password is necessary. It manages various compressed files through its intuitive streamlined interface. Next, choose from either brute-force or dictionary attack and set up the parameters. It takes some time before the password is cracked. The interface of the tool has several buttons on top of the screen. Step 3 Choose Password Cracking Engine Now choose the crack method, as shown below: Brute Force Attack - Requires the range to be set Caps, digits and symbols. Plus, the fact that you have to upload your file over the Internet into someone else's servers puts it at risk of being hacked. Therefore, in order to secure data, you will need to remember the passcode key as well. It decreases the running time of the attack by limiting the scope of the search, but there is no guarantee that it will find the password successfully. Then, you can select which character set you think the password contains. These buttons are start, stop, help, about and exit. What is the password for the achive? Afterwards, you can click on start to begin the process. Before this tool, there was not any hope to get back your data. The control will be in your hand to make the size free, compress and enhance the file size. There is also a link to a brute force application. The interface consists of four tabs namely recovery, brute-force, dictionary and options. There are no problems in finding what you need. All these mentioned operations does not give attacker access to contents he or she is still unable to extract data , only list it or destroy it. Please install the latest drivers see above. What is the password for the achive? Uploading something password-protected and meant for the public without providing the password at some central place is nonsense. It can only recover passwords with four characters or less. The service will open your file and take a screenshot of the contents to show you that the password has been recovered, before they ask you to make payment. Provide details and share your research! It would take days or even weeks to break the password if it was strong enough more than 10 characters. Then see if the encrypted strings match. The brute-force mode allows you to select among letters, numbers and symbols, depending on what you think is the password for quicker retrieval. Self-extracting archives and multivolume archives are supported. Not the answer you're looking for? So on huge file-sharing forums there are not as many possible passwods as files but as many possible passwords as users. We expect answers to be supported by facts, references, or expertise, but this question will likely solicit debate, arguments, polling, or extended discussion. It takes some time to produce endless password combination. For the last tab, it shows the list of passwords. There is no password to the crark's executables and configuration files. Ask your family members if they knew the password. What Protocols Does Hydra Work With? It's possible that you quickly jotted it down somewhere - either in a Notes application on your phone or computer, or maybe even on a physical notepad. Choose the one that works best for you. It makes use of the brute-force technique in finding the password.